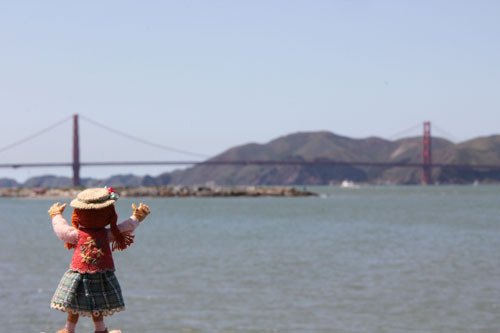 We walked along the waterfront, where Polly gazed at the Golden Gate Bridge in the distance. 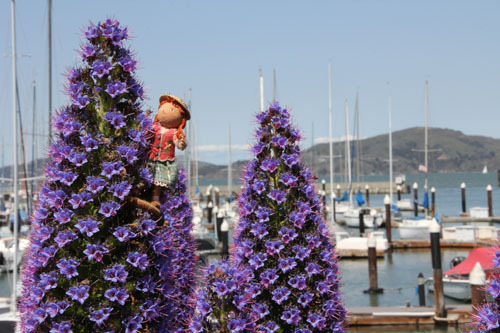 These amazing purple blue flowers were growing around the marina. 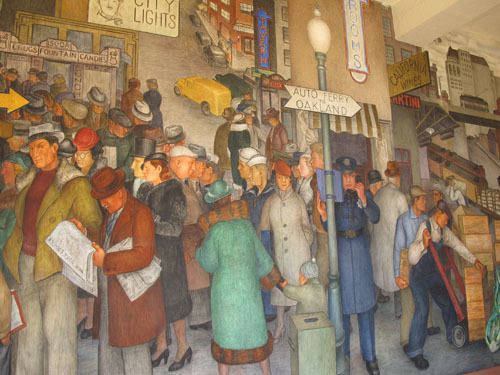 After climbing Telegraph Hill, we went inside Coit Tower and were drawn into the WPA Depression-era murals, which depict California’s economic and political life. This entry was posted in Polly Doll, Travel by Salley Mavor. Bookmark the permalink. Oh, my, she found some fabulous blue flowers!!! This is so much fun, like reading a wonderful book with the most charming little traveler!!! More, please!!! Oh, the flowers were wonderful and the murals – beautiful. Thank you so much for taking us on the tour with you and Polly. It seems you chose the perfect day to visit the Fisherman’s Wharf! The waters are blue and flowers are in bloom. 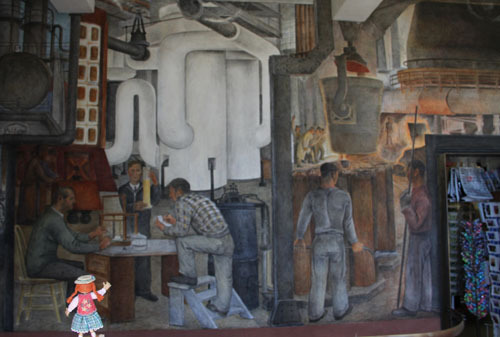 I wonder if those huge Murals were painted by the famous Mural artist Diego Rivera? The lilies sure look like those I have seen pictured in some of his famous paintings in Mexico. Thanks for sharing. 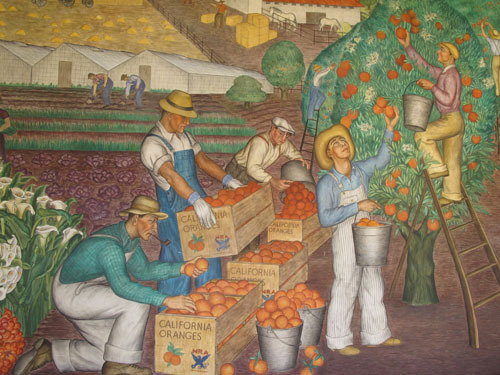 Thanks for checking in, Rebecca, the murals were painted by 25 artists hired by the federal government in the 30’s. 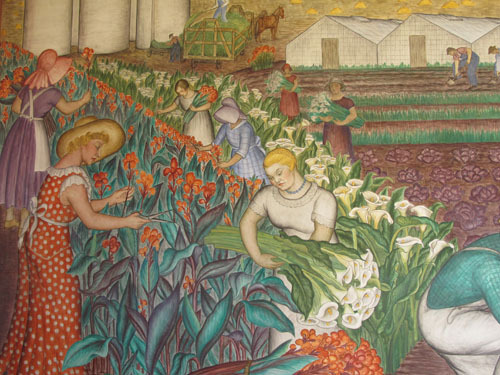 Although not by Diego Rivera, they were surely influenced by his work, both artistically and politically. 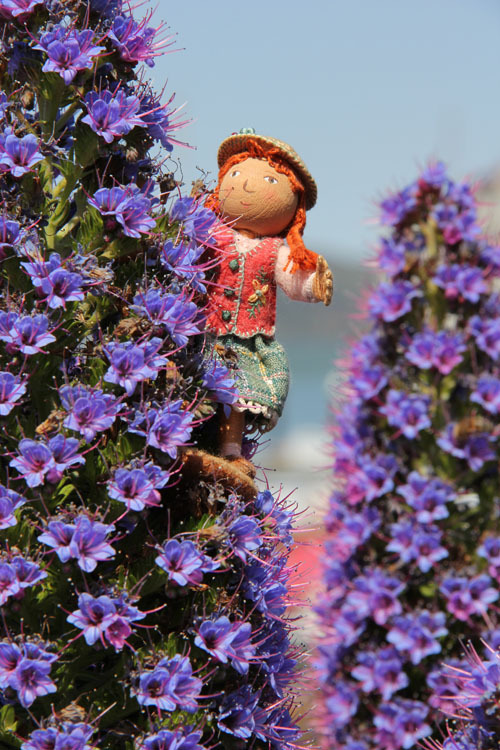 Polly, Those blue flowers are known as Pride of Madeira (Echium candicans) a perennial shrub out here in the Bay Area and endemic to the island of Madeira. 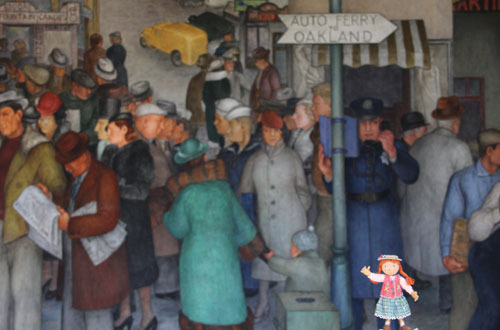 The Coit tower murals are by a variety of WPA artists and are real frescoes. The lilies are Calla Lilies, also perennial out here. Thanks for the name of the flowers, Ashley. It was so good to see you on your home turf! And to see you, Salley, in our lovely City by the Bay. I hope you had a ball!